There was there was a full house and a festive buzz in the air at CAMRA (Campaign for Real Ale) Vancouver's Annual General Meeting held Sunday, Januray 23rd, at Surrey's Central City Brew Pub and the party atmosphere was due to more than just the free pints of Gary Lohan's two great casks creations and the $3.50 pints that are the norm on Sundays at Central City. Over the past few years, CAMRA's executive have worked very hard in regards to raising their public profile, recruiting new members, organizing/sponsoring events and supporting local businesses which has created positive energy that is quite palpable in the Vancouver craft beer scene. People interested in craft beer are beginning to sit up and take notice of CAMRA Vancouver as they present themselves as a more polished and professional group acting with purpose. This was my first CAMRA AGM and I was impressed with the membership support and with the new executive's plans to get members, beyond the executive, more active and involved. A sign of the times that CAMRA Vancouver is actively trying to define their roll, focus and relate to their membership and beyond, is the open letter sent electronically, via their weekly newsletter and distributed at the AGM, entitled "CAMRA Vancouver, greater than the sum of its parts". This open letter, dated Dec 14/10 and authored by then President, Lundy Dale and current President (then Vice President), Martin Williams, defined what CAMRA Vancouver is all about. In the opening of the letter, Dale and Williams hinted at the fact that many, not involved in CAMRA's executive, did not have a clear picture of what it was CAMRA Vancouver does. The letter defined what CAMRA was all about, where they are today and where they were planning on going in the future and challenged the membership to get involved to guide the group's future direction and actions. "Its getting there," states Martin Williams in regards to CAMRA Vancouver achieving its goal of being an effective consumer advocacy group. "We (CAMRA) are young, only eight years old in Vancouver. There is a desire to be more active and to have more to say. CAMRA is membership driven. The volume of the voice is dependent on the number of voices working in concert. "What I would most like to see is membership in CAMRA increase and become more active. If 10% of our membership spent 2 hours a week doing some research into why we can't get the beer we want and served the way it should be served, we would have enough ammunition to make demands for real change to the rules that are holding us back. As it stands right now, we really don't know. We have a fairly good idea, but we don't have the facts to back us up. A more active membership would make for a more effective voice working on behalf of the craft beer drinkers." Until last year, I avoided buying a CAMRA membership because, to tell you the truth, I really did not see any reason why I should join. I have been aware of CAMRA since the 1980s, when I came across CAMRA beer festivals while living in the UK and came in contact with the group here in BC in the mid-1990s, but I could never really figure out what they were actually doing locally to campaign for real ale and craft beer. From my perspective, CAMRA, at least locally, was nothing more than a beer appreciation group who really had no obvious or definable campaign other than to organize the odd beer festival and discounts on craft beer. It seemed like a small, select group who used the name of CAMRA as an excuse to meet and drink beer. I often felt the CAMRA members I came across in bars and at festivals were nothing more than beer snobs who actually set back the campaign to promote craft beers by annoying and/or offending those who did not drink craft beer instead of trying to introduce them to and educate them about these wonderful brews. Now remember, this was my perspective and I know it may ruffle a few feathers, but I was not alone in thinking this way, having met many others who voiced similar thoughts. Whether this was true or not, this was one opinion of CAMRA that was out there in Vancouver, but because of the hard work done over the past few years and the explosion of the craft beer scene here in BC, this negative opinion held by some about CAMRA is fading away rapidly. And, in my opinion, rightly so, as CAMRA Vancouver is definitely moving in the right direction and truly organizing a campaign that is helping local craft brewers find their rightful places in the pubs, restaurants and liquor stores of our province giving local craft beer lovers more access and opportunity to consume local craft beers. Vancouver Craft Beer Week (VCBW) co-founder, beer writer and former CAMRA Vancouver President, Rick Green, agreed, at least in part, with my view of CAMRA Vancouver, past and present, when I queried him recently about his thoughts in regards to CAMRA's growth. "When I joined CAMRA in 2006, it was very much a beer appreciation group hanging out at (former brewbup/restaurant) Dix, really only trying to pick up new members from the low-hanging fruit at Caskivals," said Green, who included himself as one of the low-hanging fruit. "In 2007, I decided to take over the CAMRA Secretary position from Jack Enright who, as a service to the membership, sent out an irregular e-mail with the latest news about casks, new beers coming out, events, etc. Considering that CAMRA was supposed to be a campaign, I thought that if we were going to be anything of the kind, we needed to increase the membership and communication." Green, who comes from a multi media background, felt the best way to increase membership and communication was by publishing a regular e-newsletter that anyone, not just members, could subscribe to. "If the quality of the information was sufficiently high, those who like good beer would probably forward it to their cohorts and our subscriber base would grow. We would then have a better means of converting those subscribers into members if they could be shown the value of doing so. The strategy succeeded and we saw our membership grow significantly." Today the CAMRA Vancouver Weekly Newsletter, overseen by Ryan O'Connor, is sent electronically to approximately 900 people on a weekly basis, according to CAMRA Communications Director, Monica Frost's report at the AGM. Of those 900 people, approximately 50% are opening the letter weekly and nobody knows how many of those people are forwarding the newsletter to friends and associates who drink craft beer. The newsletter has recently made some major improvements and regularly lists craft beer events, such as weekly cask nights, beer festivals, food-beer pairings and beer tours, that are independant of CAMRA. The newsletter also supplies information about new arrivals at local liquor stores that feature craft beers and has links to many local beer bloggers such as myself. CAMRA Vancouver's efforts to reach more people, has grown beyond their weekly newsletter. Anyone who has a Twitter (CAMRA_YVR) or Facebook account can follow CAMRA Vancouver and they have done an excellent job utilizing social media to promote all things relating to local craft beer. As well, CAMRA Vancouver has brought in Brooklyn Galloway to act as a Creative Design Director and as a result their website has more professional and polished look about it. 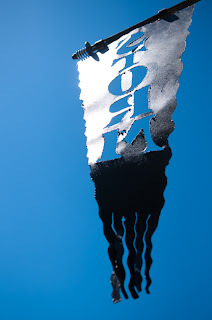 "Our overall image has been taken to the next level of professionalism with our new website," states Frost. "We are also very active in giving updates and communicating through our social media outlets, such as Facebook, our Weekly Newsletter and Twitter." Another focus of CAMRA Vancouver, dating back to the Rick Green days, has been to focus on organizing and sponsoring events to try to promote the cause. According to Green, who became president in 2007, he and his executive decided to try to bolster the membership and encourage local businesses to feature craft beers by this means. "We also put a concerted effort into supporting events and hosting beer events as another way to attract new members and to demonstrate to other establishments what could be done to better serve their customers," states Green. Althought organizing beer festivals pre-dates Green's days with CAMRA, organizing and sponsoring events took on a more significant role during his era and has continued to grow in importance and popularity. Last year CAMRA Vancouver really came into their own as far as events go with their final event, The Winterfest of Ale, held Dec 4/10 at St Augustine's, selling out well ahead of time, leaving many disappointed. In my opinion, it was one of the best CAMRA festivals in quite some time, with the event attracting an eclectic, cross-section of craft beer lovers to sample the impressive line-up of beers. As well as hosting and sponsoring a festivals, CAMRA supports the local cask nights, which are held almost every night of the week around the Lower Mainland and and various other beer events such as beer-food pairings, Vancouver Craft Beer Week and BeerTourist, helping them be successful by promoting them and getting the word out there and them. Lundy Dale, who stepped in for Green as president in 2010, believes that supporting events is a key way to reach out the the general public, to promote craft beer and build CAMRA's membership. "While Rick Green was aboard as president, his strength was media and he was great at getting the word of CAMRA out there. My strengths lie in organization and events. Our membership increases with every event." This combined effort of supporting and sponsoring events and reaching out to the membership, and beyond, utilizing social media and the internet, is paying off and helping expose CAMRA to a wider audience. "In the past year we have been actively engaging members, supporters, the general public and bloggers in a movement towards supporting craft beer and specifically the local community," explained Frost. "Our growing member and corporate support base is an indication of some success with that (strategy) but also the fact that at our events, the number of non-members to members is usually split evenly at about 50%. That tells me that our social media efforts are being seen and we are drawing new people in. One of our focuses for 2011 is converting that interest to memberships which in turn raises the volume of our voice in the community." Even though CAMRA's individual and corporate membership is growing, their events are selling out and their support is bringing more and more people out to events independent of CAMRA, they are not about to sit back and admire their handiwork. CAMRA is now looking to broaden their role and try to encourage their members to really effect change in the craft beer industry by becoming more educated about the issues in order to act as a credible lobby group. "Every time there is a change in executive, things change," explained Dale, who is moving on serve as president for CAMRA BC. Dale went on to say that when she took over for Rick Green as CAMRA Vancouver President in 2010 and Martin Williams took on the roll of VP, there was another slight shift in focus towards becoming a more vocal consumer advocacy group. "Martin has the passion and the energy to get the word out there and make things happen," says Lundy. "I am looking forward to working with him on a number of projects that will be suitable for all of CAMRA BC." As mentioned above, Williams would like to see a more active and vocal membership. His belief is that CAMRA really should be greater than the sum of its parts. "I'd like to see CAMRA become a research machine," says Williams. "We should know all the rules as they apply to our beer, what their intention was when they were being implemented, and whether the current situation has evolved from then. "I do want to see CAMRA having a more active voice. Our voice should have weight. We should be referenced whenever beer policy is concerned. However, as I said as the AGM, we have to have something behind the mouth before we open it. If CAMRA is to be credible, what is says must have value, have a basis in reality and ring true. That can only come if we understand the questions, our goals and the goals of those who would have craft beer, and the enjoyment of it, out on the back shelf. That all might sound very heavy, but changing policy, dealing with political issues is heavy, and mostly boring details." It is this kind of energy and purpose that lured me into the fold of CAMRA Vancouver and has me putting fingers to keyboard to tap out this blog. I want to be involved and have my voice heard. I no longer see CAMRA as just a beer appreciation group, even though all involved certainly do appreciate good beer. It has turned in to something more and if people like Williams have their way, CAMRA will become the voice of change in the future. But as Williams pointed out to me, even though Vancouver's carft beer scene has exploded, we have a long way to go. "Even today, though the population is close (in numbers), Washington (State) has 150% the number of breweries than BC," says Williams. "I needed to play a role in changing that. The first step was joining CAMRA Vancouver. "The second step was getting involved." So if you are sick and tired of seeing the ridiculous price we pay for beer here in this province, or annoyed that your craft beers get served in frosted glasses that taste like soap, or that your local pub/restaurant/liquor store does not offer local, craft beers maybe, like me, it is time to get involved and make your voice heard. If enough of us shout at once, in unison and with something informed and intelligent to say, maybe someone else will take notice. Even though Williams is dead serious about trying to organize to shake up the status quo, he still keeps things in perspective. "In the meantime, we can drink fine ale while we work, laugh some and enjoy some good comradery, as we fight the good fight," says Williams. 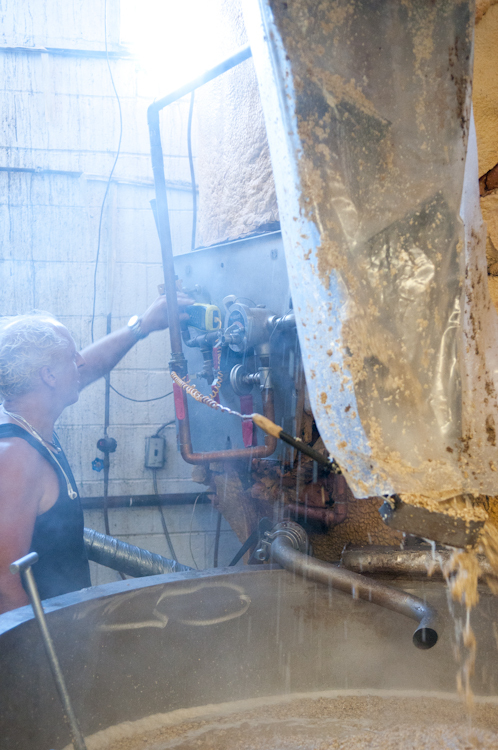 "We have the right to drink good beer, made by the traditional methods, served as we like it. "It is a right worth fighting for." Now that sounds like a campaign I want to be apart of. If you want to learn more about CAMRA Vancouver, check out their website where you can get all the information you need, subscribe to their newsletter and join the ranks. I was introduced to James Walton, owner and head brewer of Storm Brewing, in 1996 by the manager of one of my haunts on Commercial Drive. 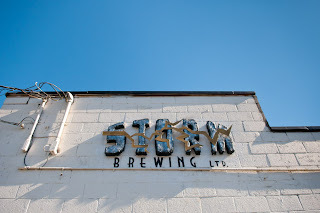 Storm was one of the few microbreweries in Vancouver at the time producing craft beer and trying to carve out a niche in the local beer market which was then dominated by the big, national breweries. Since that time, I have had the privilege of getting to know James as both a friend and an employer. He introduced me to craft beer and changed the course of my life forever by doing so. I recently caught up with James, convalescing at home after his recent car crash and chatted about old times, craft beer and the state of the Vancouver beer scene, past and present. The result is a two-part story, the first part focusing on the beginnings of Storm Brewing and how it developed and the second part, which will be out before the end of the month, focusing on the unique character that is James. I hope you enjoy it. As an added bonus, I have been given permission to utilize photos taken by Wendy D Photography at Storm Brewing this past summer. For more photos of Storm and Wendy D Photography, please click on the links supplied. I hope you enjoy the stories and photos. Back in April, 2001, I went to see Shane MacGowan and the Popes play at the Commodore Ballroom. The opening act, a local group called The Real MacKenzies, were forced to play an extra-long set that night and when MacGowan and The Popes hit the stage, over an hour late, MacGowan was falling-down drunk. The concert was legendary and despite being incoherent, while slurring in between songs and hardly able to walk, MacGowan delivered an amazing performance with his signature rasp and growl. I was working for Storm Brewing at the time and the next day, while at work, I was chatting with Storm's owner/brewer James Walton. Upon hearing about the concert and MacGowan's extremely inebriated state, James told me he had supplied a keg of "fortified" Storm Highland Scottish Ale to The Real MacKenzies to enjoy backstage. Apparently MacGowan discovered the keg and, as he is known to do, proceeded to drink himself into oblivion and fell down some stairs before going on stage. I am not sure if this is a true story or not. Being of Irish decent, I never let the facts get in the way of a good tale. But a believable story it is. Talk to anyone who knows James, or who has been associated with Storm and they will be able to tell you a colourful story or two. I know I have enough to fill a book, but due their adult nature and my desire to to protect the guilty (especially myself), I will leave said stories unpublished. They are legendary tales and make no mistake, James Walton and Storm Brewing are legends in Vancouver beer scene. Not often in your life do you come across such an innovative, generous and, yes, colourful person as James Walton. He is unique and his brewery truly reflects that. Everything about Storm Brewing screams James, from the brewery's McGiver-like construction, to the innovative and interesting brews produced, to the fact that at the brewery's 10th anniversary party sushi was served on a platter that consisted of a beautiful and very naked woman. His philosophy and business model are definitely not the norm. For James, being a brewery owner and craft brewer is part of a lifestyle, not a job. So how did James come to be the owner of Storm Brewing and become one of Vancouver's most iconic brewers? As it turns out, it was not originally his idea. Back in 1994, James, who studied industrial mycology on his way to obtaining a degree in biology, was working as the Night Manager for Stanley Pharmaceuticals. He was married at the time and his life looked similar to that of tens of thousands of other Canadian thirtysomething males. "I was bored with my job and looking for something entrepreneurial to do and my ex-wife, of all people, suggested a brewery," said James. Being an avid home brewer since age 15 and a lover of good beer, the idea of having access to unlimited amounts of beer he liked was irresistible. So, with no formal training in brewing and limited business experience, James started making preparations to create Storm. After finding and leasing the space at 310 Commercial Drive, where the brewery is still located, James drew up the plans for what would become Storm. "I specifically picked that (north end of Commercial Drive) because it was close to Shaftebury," said James, referring to the now closed Shaftebury Brewery, which was located just around the corner and who were making in-roads into the beer market with their craft beers at the time. "I thought it would be a good idea to have my brewery close to them so if I got desparate, I could get help if I needed. "After I signed the lease, I figured out how much money I thought I would need and made a list of what else I would need and scribbled it down on the back of a napkin. Then I started scouring the scrap yards." Having grown up on a farm, James was handy with a welder and had a working knowledge of machinery. He also had an idea of what he needed to construct to move large volumes of liquids, due to his work with Stanley, so he proceeded to piece together the brewery himself. To this day Storm has that homemade, patched-together appearance. 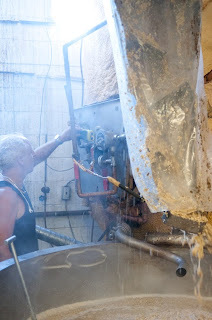 It looks like it was created by a mad scientist, but there is a definite method to the madness and, despite how it looks, the brewery has been producing unique, quality craft beer for over 15 years. As if fated, Stanley Pharmaceutic had a massive layoff about a month after James started work on the brewery and he saw his opportunity to give Storm his undivided attention. He took part of Stanley with him, stating his "payout" from the company included a stainless steel tank and an industrial scale, both of which were incorporated into the brewery and remain there today. The first beer Storm produced was Red Sky Alt, which James still believes is one of the best beers he has ever produced. The Red Sky recipe was one he had played around with as a home brewer. "It was a delicious, one of the best (beers) I've ever drank," said James of the Red Sky. 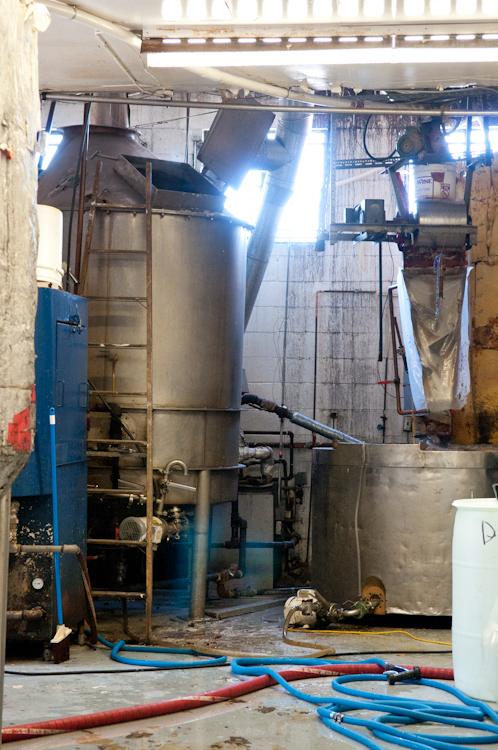 "I don't know how many five-gallon batches I made. I made batches and batches, getting the recipe just right." Once he was satisfied the recipe had been perfected, James began to produce brewery-scale batches and Storm Brewing was officially launched in June, 2005. James is one of the truly independent brewers. Except for his wife, with whom he split with three months after Storm launched, James has had no partners and no financial ties. In other words, he has had complete control of the brewery and the beers produced. All Storm's recipes, except for the Highland Scottish Ale, which was designed by former Storm employee David McNulty, have been designed and created by James and many of the early ones were his home brew recipes which he "tweaked" to work on a larger scale. 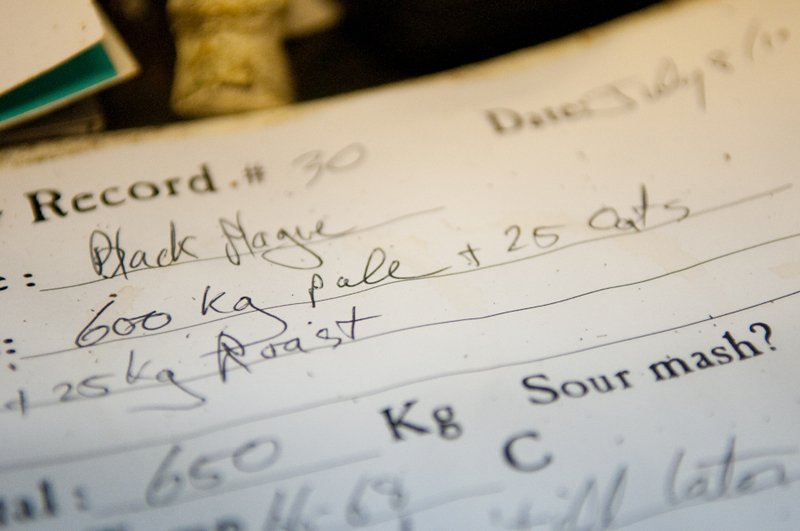 His experience as a home brewer helped guide him in the early days. "It is the same thing but bigger, " said James when asked how brewing at Storm was different than brewing at home. "Basically, anyone can make beer if they want to. It's really not that difficult. The trick is to keep it interesting and fun." The Vancouver beer market at the time was just beginning to accept to craft beer and James had to be persistent and endure a lot of rejection to find his niche. "I was so attached to my beer," he said. "The rejection was devastating and I couldn't handle it so I had to get a friend to help (with sales)". James was told over and over, in the early days of the brewery, beers like Red Sky, Hurricane IPA and his now award-winning fruit lambics were unsellable and sometimes, undrinkable, but he knew there were others like him in Vancouver who loved craft beer and would pay to drink it if available. Slowly James found places willing to put Storm on tap and his beers soon developed an almost cult-like following. In today's Vancouver craft beer market, it is still tough for breweries to find space for their taps, but for completely different reasons. 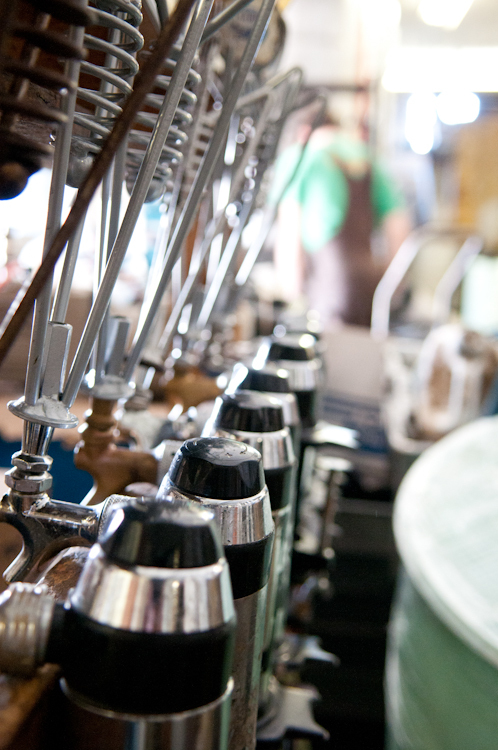 Craft beer taps are found everywhere and as a result a few local breweries, who produce craft beer, have ramped up their production and are aggressively selling their brands to grab bigger and bigger shares of the market. Business can be cutthroat as beer reps vie for sales. Despite this explosion in craft beer sales and the fierce competition, Storm has have managed to hold their share of the market without having a dedicated sales representative or marketing scheme. Storm is advertised mainly by word-of-mouth and by reputation. I don't know how many local art shows, fund raisers and community events, both underground and mainstream, I have gone to where I have spied the distinctive Storm tap handles behind the bar. James has been a staunch supporter of his community and the arts since Storm's inception and this generosity and support, in the form of supplying beer, has helped spread the word and exposed a very eclectic cross-section of Vancouverites to Storm beer. As well as resisting advertising, James has resisted expansion as well. According to James, he has had a few offers from those interested in buying Storm, but he has turned them away without a second thought. He has also resisted increasing his tap presence in local bars and restaurants so that he can maintain control of the beer which he believes would be compromised by increasing production and growing the size of the brewery. "It is a feeding frenzy now," said James about the Vancouver craft beer market, "but it has never been about the market share for me. I don't worry too much about what the other (breweries) are doing. I have about 35 taps around the city and have been consistently around that (number) for over ten years. It is right about where I want to be." 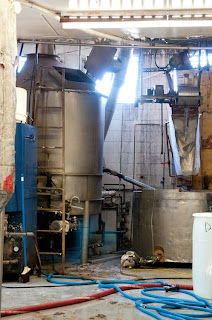 I can recall coming back to the brewery one day, proud I had found a few solid leads for new clients. Instead of being excited about doing more business, James looked at me seriously and said, "it is not about the quantity of work Paddy, it is about the quality of life while you are working, " at which point he poured me a beer and lead me onto the loading dock to enjoy the sunshine. He never asked about the leads again and I never brought the subject up again. Such is James and Storm Brewing. As I said, he is a unique man, with a unique business plan. He is also the best employer I have ever worked for and not just because of the free beer. Check back next week for Part Two of the story where I will focus more on James, the individual and how his personality has shaped Storm and the beers produced there. In the meantime, check out Storm's website to find out about Storm's tasty offerings and where you can find them on tap. To give you a head start, you will find Storm beer, including the brewery's award-winning and unbelievably different Insane Fruit Lambic, at The Alibi Room, located at Main and Alexander and St Augustine's, on Commercial Drive at the corner of N Grandview Hwy. If you have never tried it, you better do so soon as rumor has it, supplies will run out before summer. The Vancouver craft beer scene is a colourful one, rife with strong personalities and interesting characters. Late in 2010, before going on vacation to Mexico, I hinted that I was going to get beyond the beers and take a look at some of these personalities and characters by interviewing those who actually create the tasty brews we spend hours searching out, talking about and yes, drinking. Now I am back and ready to get up close and personal with some of the most prominent and interesting brewers in the BC beer scene. If things go as planned, I will interview one brewer a month in a series of posts I am going to entitle "Last Call with WanderingPaddy". In January, I will begin the series with an up-close and personal interview with James Walton, owner, creator and head brewer of Storm Brewing, one of Vancouver's most iconic microbreweries. 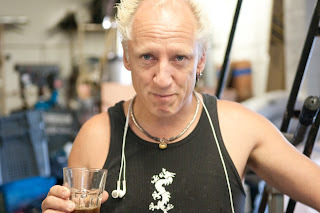 In addition to having had the pleasure of spending time interviewing James, someone I consider a close friend and one of the true characters of the Vancouver beer scene, I have had the privilege of being granted permission to utilize and great series of photos, shot at the brewery by Wendy D Photography! If all the interviews as interesting as the first, this should be a lot of fun. I hope you enjoy the posts and stay tuned to VanEast Beer Blog. Last week I endured one of the worst hangovers I have had in years. On a scale of 1-10, 10 being paralytic in nature, it was a 12. My consumption rate the night before had been moderate, by my standards and did not warrant such cruel payback. It was a few cheeky pints catching up with friends at St Augustine's, where the beer is fresh and the lines are pristine. So why did the drinking gods deal out such harsh punishment? Despite being back in VanEast for two days before my hangover, I am blaming Mexico, where I had just spent the previous four weeks before my day of reckoning. Actually, to blame the country of Mexico is not fair, so I will point the finger of blame more accurately at Mexican beer even though not a single Mexican beer was consumed on the night in question. It is the state of the Mexican beer scene that is to blame...let me explain. One of the items on my agenda, while visiting my wife's family in Acapulco, was to check out the state of the Mexican beer scene. Researching for this blog, as I framed it to my very understanding wife, seemed like the perfect cover for me to sneak away from time to time for a quiet beer. I have been to Mexico several times in the past and have always found the majority of the beers almost undrinkable: low alcohol, highly carbonated, mass-produced, light lagers, such as Corona and Sol. But, surely, in a country with a population of over 112 million, there must be someone producing some sort of craft beers. Mexico City alone has a population that rivals the population all of Canada! Every where you look in Mexico, beer is available and being consumed, so there must be a market for quality, local, craft beer. If there is a beer scene in Acapulco, I certainly could not sniff it out. The state of things in Mexico related to beer reminds me of Canada, circa 1980, when the three big breweries, Carling, Molson and Labatt had a stranglehold on the Canadian beer market and offered nothing but bland lagers. Craft beer and microbrews were unheard of in BC at that time. It was a sad state of affairs compared to today's craft beer boom. The beer market in Mexico is controlled by two major beer conglomerates those being Grupo Modelo, and Cerveceria Cuautemoc Moctezuma who battle fiercely for the market. In fact, many of the convienence store chains are loyal to one or the other brewery only so that your choices of beers are even more limited. Of the two breweries, Cuauhtemoc Moctezuma, which is apart of Heineken International, is at least making an effort to produce some different varieties of beer, although none come close to craft beer standards. In addition to Dos Equis lager, Sol, Tecate they have managed to branch out and, in my opinion, produce Mexico's best beers. 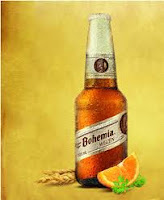 Their flagship beer and considered by most Mexicans to be the best beer in the country, is Bohemia. There are three different styles of Bohemia, all of which are very drinkable, especially when compared to the competition. Bohemia clara (clear), a "pilsner" style beer and is definitely the class of the clear beers in Mexico. Bohemia obscura (dark), is a rich, dark beer, described as a "Vienna style" beer and last year Bohemia came out with a weizen style beer with hints of coriander and orange peel! This beer is very refreshing in the Mexican heat and quite different from any other beer I have tasted in Mexico. Cuauhtemoc also produces a seasonal beer called Noche Buena, which means Good Night and refers to Christmas Eve. It is available yearly in November and December and is a described as a bock. All the Bohemia beers are considered strong beers in Mexico coming in at 5-5.2% ABV. Even though these beers are considered by many to be the cream of the crop, they are also the hardest to find. The Bohemia obscura is found in many restaurants but I could only find the clara and weizen versions in a "special edition Frida Kahlo" packs in Sam's Club (similar to Costco). Modelo, owned in part by Anheuser Busch, produces Mexico's best known beer, Corona, and several other similar beers. Only Negra Modelo and Victoria seem to offer any sort of variety. Negra Modelo, my favorite Modelo beer, is a dark beer described by Modelo as a "Munich dunkel" and is widely available here in BC liquor stores.Victoria, which is an amber colored "Vienna" style beer, offers some body and taste, but is just barely a step up from the Coronas of the world. Other than that, I was very unimpressed with Modelo's beer line-up and tended towards their competition, much to the chagrin of my brother-in-law who used to be very high up in the Modelo organization and who is very loyal to his brand. After these two breweries, there seems to be a great void in the Mexican beer market, with microbreweries, beer bars and brew pubs being rarities. I am told they do exist but I have yet to find one, or talk to anyone, Mexican or otherwise, who has drank Mexican craft beer. I have read on the internet that there are a few dotted around the country, specifically in Baja, Guadalajara, Mexico City and Tijuana. They certainly were not in the Acapulco area and from talking to the locals, it does not seem there is a desire or market for craft beer there. When I attempted to talk to my friends and relatives about the subject of craft beer they honestly had no concept of what I was talking about. Each and every one of them pointed out that there were numerous beers available in Mexico and did not seem to grasp that they were all virtually the same: mass-produced, light beers with little to no body or flavour, highly carbonated and 4-4.5% alcohol . So what does all of this have to do with my hangover and how did it contribute. Well, after returning from my vacation, I was itching to get down to my local watering hole to treat my taste buds to some big-hop, Pacific Northwest IPAs and see what else was new on tap. As it happens, I found North Coast's Old Rasputin Imperial Stout on tap at St Augustine's and as an added bonus, it was pouring from one of their recently installed nitro taps! 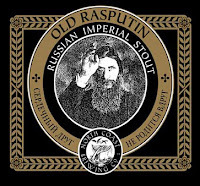 For those of you who are not familiar with Old Rasputin, it is a world class imperial stout and a must for all stout lovers. 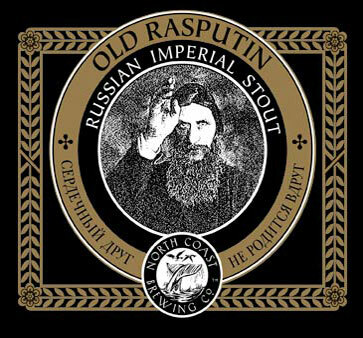 And for those of you who are familiar with Old Rasputin but never tasted it poured from a nitro tap, do yourself a favour and search it out! It is well worth the effort. It is amazing how easily this 9% ABV monster beer goes down. But it seems, after four weeks of drinking low-alcohol, bland beers, my tolerance level for the strong beers, widely available here in Vancouver, had been greatly reduced and I was not prepared for the full impact of this amazing black beauty. I quickly recognized this, and, during a momentary lapse of reason decided, despite the sublime quality of the beer, I needed to get home before more damage was done. But I could not bring myself to leave before ordering a Red Racer IPA to get my hop fix. Well, gearing down from 9% ABV to 7% ABV did not really help my cause, hence my predicament the next day. I was not planning to overindulge, but the great taste of these beers lured me into having one more than I should have and the strength hit me hard after a month of 4-5% beers of which I really could only tolerate a few before getting boated. I truly hope that one day, someone in Mexico will see the need to produce different styles of craft beers. It is a market that is wide open and I believe, like here, in the 1980s and 1990s, if quality craft beers are introduced into the market, they will eventually catch on and take a chunk of the market away from the big, dominant breweries. So if anyone is looking for a warm climate to start a microbrewery, Mexico may be the place to go...you certainly won't find a lot of competition, although selling the idea of craft beer to the locals may be a tougher sell than you think. If anyone knows of any craft breweries in Mexico, I'd love to hear about it so I can further my research next year when I go down to visit my in-laws.